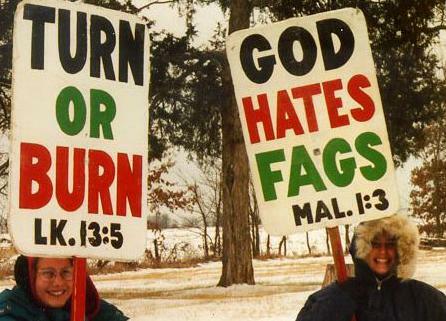 Let Me Go On &; On...: Christians Chant: "God Hates Fags!" 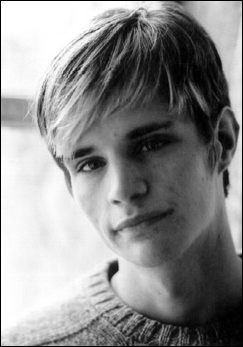 Matthew Shepard beaten to death because he was gay. 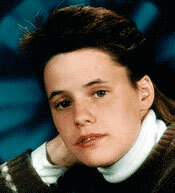 Teena Brandon (or Brandon Teena) was raped and killed due to the intolerance of her lifestyle. …”Sadly - The only thing Deb and the "Gay Christian" community is doing is 'loving' and 'tolerating' people STRAIGHT to hell.” Dani says. Isn’t that what Jesus did? He loved and tolerated those who sinned. We’re all sinners- regardless. This story below proves that Jesus accepted sinners. The most important thing to Him is that you love Him with all your heart. That’s the most important commandment of all. Fundamentalist Christians scare me. Extremists of any religion scares me, because they’re a potential danger to those who are different. They have absolutely no tolerance for anyone who doesn’t fit their standards of being a “Christian” or whatever religion they stand for. Look at 9/11. Extremist Muslims killed for their God. Look at all the hate crimes committed, such as Teena Brandan. Two men brutally raped and beat her up, because she was a transexual. Matthew Shepard- killed and murdered due to his orientation; due to intolerance for homosexuals. How far does it get when one feels the need to “kill off” homosexuals, or those who are different? It goes with any “differences”. Whether you’re black, Jewish, Muslim, gay, homosexual or in an interracial relationship, people will find a way to ridicule you and possibly hurt you. Has the world become so insecure with themselves that they feel the need to hurt those who don’t live as they do? 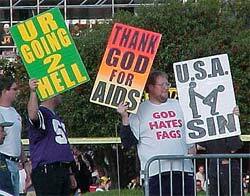 Some say that the real meaning of being a homophobic is out of insecurity of being a heterosexual. In my opinion, hating those who are different from you stems from hating something within yourself.